Have you ever faked it? No? Be honest… you have so! We all have. I was attending a Professional Development today I found to be very thought provoking. The speaker asked this question, Do you think it is okay to let the people you work with know if you are having a bad day? My immediate response was yes, of course it is! We are all human. Then he brought up other another point. If you have been saving all year to fly to New York to attend a Broadway Play starring Julia Roberts. She is a bit crabby and not “feeling it” today. She walks on stage and mumbles her lines. Would you be so understanding? NO WAY! I would be ticked off!I know I am ticked off when Hockey Players don’t bring their “A” game – are you listening Edmonton Oilers? The same holds true for going to work everyday. I don’t know about you, but I love to be around the people who smile everyday, seem happy to be there, and have a genuine positive attitude about what they do. Being around positive happy behavior, breeds positive, happy behavior! It makes me WANT to come to work. If you are grouchy, never smile, complain about everything, chances are you do not have positive relationship with your co-workers. This would breed negative, gossiping behavior. I don’t know about you, but I don’t want to be around someone like that everyday – ALL DAY. The sad reality is, I did work with people like that. Working in a negative environment made me feel physically ill. I called in sick a lot. I bought copious amount of lottery tickets. Although it is important to like the work you do, it is equally important to like the people you work with. I do know it is possible to start the seeds of change by bringing the positive attitude to work everyday. You may not feel like it, but before you walk through those doors into your office, slap a smile on your face. Fake it. Be polite! Start speaking in a positive tone. Avoid, “I can’t” and substitute “I’ll try”. Before you know it, you are not faking it, you are living it. 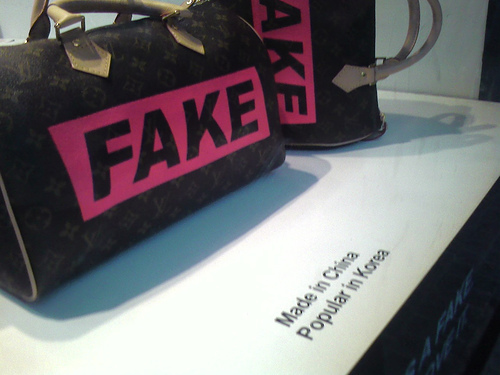 I’m sure you can apply this “fake it” system into everyday life. It can build relationships! My friend User ( so called because she keeps EVERYTHING until she finds a use for it) always says, “Fake it ’till you make it.” Excellent advice! It works for everything you are shy about, or feel insecure about too! Walking in a neighborhood you shouldn’t be in? Walk with confidence, fake like you are the one suppose to be there. No one will mess with you! Have to stand up in front of 100s of people to talk about something you are sure will bore them to death? Fake it! Act like they paid to come see you! Before you know it YOU will believe it. Apparently it works for physical work outs too. Fake it ’till you make! I am about to jump ahead with both feet taking huge risks to be apart of a new adventure. I’ll let you know how it goes. Meanwhile, I think I will need some of that fakeness tomorrow to get the ball rolling. I love faking! If it wasn’t for slight dishonesty, I’d be broke, alone and jobless. YAY ME! Good food for thought. Positive people are such a pleasure to be around. I love their energy. We all need to do our party to contribute to the ‘vibe’. I’m so against fakeness of any kind that my head spins anytime I catch wind of it. I have had long drawn out conversations with how it’s lying to be anything other than yourself. My solution to the workplace situation? Try to maintain a positive and productive attitude each day. I understand where you are coming from. My very basic values stem from honesty. My point is more about maintaining a positive outlook in the workplace. Save the crabbiness for your lovedones. No fair to them, but at least there is an unconditional aspect from them. Thanks for weighing in! You’re right. No-one else is really interested in whether you’re having a bad day or not, hey? Imagine if every time someone asked how you were, you really told them? Good blog post and more great food for thought. I’m looking forward to hearing about the new adventure – good luck!